Since I asked this question elsewhere, it seems appropriate that I answer it here, so I will not be accused of answering my own questions too much. However, if the questions were better on Quora, one would not have to ask cogent questions in order to give cogent answers. Be that as it may . 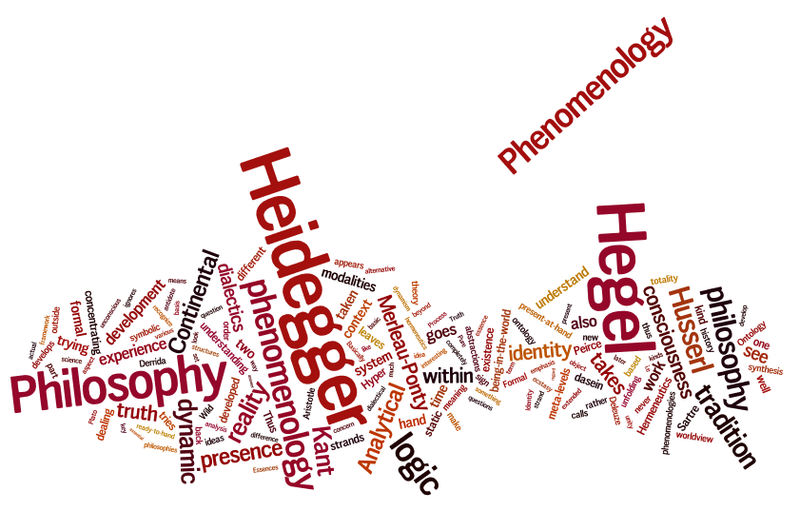 . .
My answer to the question as to what Phenomenology is would concentrate on the differences between the phenomenologies of Hegel, Peirce, Husserl, Heidegger, and Merleau-Ponty. It is of great interest that Heidegger begins and ends Being and Time with critiques of Hegel, and then goes on to use a key term from Hegel as his own key term, i.e. Dasein (Being There) which is the term for existence (determinate being) in German Philosophy, despite having the word sein in it. But Heidegger rightly refers to existence as both ecstasy and exi-stance (standing outside of Being). From this we can infer that Heidegger is trying to gain distance from Husserl, his teacher by appealing to Hegel the earlier phenomenologist, and Aristotle, for him the father of Philosophy. Heidegger treats Aristotle as if he were a phenomenologist and thus reads him anew, with the insight that Alethia is a dynamic process of uncovering the truth rather than a static verification of logical statements. This realization of the essential dynamism implied in Greek philosophy as opposed to the tradition that took philosophy as static true answers that could be verified is the basic impulse behind the break from Husserl we see in Heidegger. Heidegger is trying to make Husserl dynamic as Hegel did for Kant. However, it seems that much of what Heidegger says that appears new remains unpublished in the archive of Husserl’s work at least according to new commentators who have studied the later work such as Donn Welton. Both Merleau-Ponty and Heidegger are said to have taken liberally from the later ideas of Husserl about Generative Phenomenology, i.e. dynamic time immersed phenomenology, and this shows in their work and their obsession with the question of time, especially in Heidegger. Merleau-Ponty goes on to focus on the translucence or opacity of perception, as well as developing further kinds of Being beyond the two posited by Heidegger (Hyper and Wild). When we look at these different phenomenologies then it is the phenomenology of Peirce that stands out as being outside of this stream of the tradition. His phenomenology is prior to Husserl and is offered as an alternative to Hegel, where the phenomenology is only meant to ground logic in actual phenomena, it was through this phenomenology that Peirce realized the importance of signs in connecting logic to experience. Signs also play an important role for Heidegger, but he does not use the Percian concept of the sign. Peirce is a philosopher looking for an alternative to Analysis and Reductionism. He is a Kantian that takes Hegel seriously and then who takes that reconciliation back to logic and tries to apply it to give a grounding to logic, in order to avoid the nihilism of symbolic logic. Of course, it is ironic that this was a crucial step in the development of our modern symbolic logic. Perice contributed the existential operator. He is trying to connect Logic more to life and to see what the ramifications of that are for logic itself. One result was defining abduction (hypothesis) as the third combination of the elements of the syllogism that had been forgotten or lost in oblivion within the tradition. So there is an interesting relation between the various phenomenologies whose purpose has been to try to understand how logic and number fit into the actual processes of living consciousness within the world. It is an attempt to embody science, logic and mathematics. Each takes a different route in doing so, but the various alternatives build on each other within the tradition setting the scenes for later developments in phenomenology. And phenomenology is only one strand there is also ontology, hermeneutics and dialectics. These four strands capture most of what is central in modern Continental Philosophy. And actually phenomenology must be considered in the context with the other strands in order to be completely understood. Heidegger is a crucial player within the tradition in this regard. Heidegger includes all four strands together. Gadamer develops his strand of hermeneutics in Truth and Method. His idea of a sign goes beyond de Saussure in as much as it is dynamic, having to do with pointing at the absent rather than being merely a diacritical marker in a plenum. His ontology adds the ready to hand (Process Being or Becoming, Heraclitus, dynamic) to present-at-hand (Pure Being, Parmenides, Static). The only strand that Heidegger does not deal with is dialectics, and that is because in his time it was taken up by the Communists and he was a Nazi. If we go back and look at Hegel in this regard we can see that his emphasis was on the dialectic, trying to bring time into philosophy. Heidegger takes up this cause but says that the two modalities of being-in-the-world (dasein) are equiprimordial. Hegel’s phenomenology is of spirit/ghost/mind. It recounts the teleology of history of philosophy which developed by exploring all the alternatives of a philosophical space within the consciousness of the slave mentality. It is very interesting to see Hegel’s work on the background of the enslavement of the Greeks by the Romans. After Sense Certainty is posited, then he starts with Skepticism, Stoicism and Epicureanism as the fundamental dialectical moments of the development of philosophy in slavery. Hegel says only slaves are self-conscious, thus only they can develop philosophies. This ignores the fact that Plato and Aristotle were nobles. Nietzsche tries to reverse this idea in Hegel by developing a philosophy of Nobility. Basically dialectics explores all the possibilities of the logical space at each developmental level. He is trying to develop a dynamic logic of synthesis to counter the static logic of analysis in Kant. Kant introduced static dialectical structures at the core of his philosophy in the categories. Hegel only has a dynamic view, but that dynamic view itself is still frozen at each moment of unfolding. Moments cancel out and that is what takes us from one plateau of the development of consciousness to another. So it is only partially dynamic. Thus dynamism is partial in Hegel, and he is dealing with the totality of consciousness rather than the unity of the faculties as Kant attempts to do. Heidegger on the other hand says that these two approaches Kant (static) and Hegel (dynamic) are equiprimordial and are two modalities of being-in-the-world. Heidegger goes to what is before the arising of the Subject/Object dualism by identifying dasein as the projector of the A priori that appears primordially before the arising of that duality and which embodies temporality as the ecstasy of the projection of Being. The process of ex-stasis, projecting what stands outside of dasein is called existential by Heidegger. He develops the existentialia that concern the inherent structure of dasein as a dual to the categories of Kant which concern the inherent structure of the object. Hegel and Kant are both idealists but Hegel is trying to understand why the rationalism of Kant results in the bloodbath of the French Revolution. Kant is part of the Enlightenment while Hegel is taking his inspiration from the Romantics (beautiful souls). Hegel says that there is a determinate teleology to the unfolding of sprit/ghost/mind within the tradition and it is that fated unfolding that he records and tries to rise above in his phenomenology. For Hegel Ontology is that of Heraclitus, which he says sprouts from the synthesis of Being and Buddhist Emptiness. Thus Hegel takes as his starting point the emptiness of existence, and is probably one of the only Western philosophers to recognize existence as standing as a reference point outside the unfolding of the great chain of Being. For Hermeneutics Hegel uses the story of Antigone as his touchstone throughout. The contradiction that she is trapped within between tradition and king on the one hand and family and brother on the other hand Hegel takes as the sign of the primordial duality within the tradition between power structures and familial allegiance. So in Hegel the emphasis is on the dialectic, which is taken from Plato and developed on the basis of Skepticism, which is an image of Buddhism in philosophy. Hegel tries to find an alternative to the stasis of Kant by brining history into our account of philosophy. Thus he really develops a meta-philosophy that encompasses all the philosophies of the western worldview as they unfold, and assumes that to be teleological. In terms of Phenomenology what he means is how spirit/ghost/mind appears in our experience which is brought out from the condition of power relations and especially slavery. Husserl takes a different route by attempting to put the transcendental idealism of Kant in the context of the actual workings of consciousness considered phenomenology. So Husserl has a phenomenology of the individual thinker rather than the experience of the tradition in its development within history as an intersubjective whole. Husserl more or less ignores Hegel. But takes Kantianism in a new direction by discovering the difference between abstraction and essence perception. Basically he discounts the idea of Descartes of simple ideas. He notices that in consciousness the apprehension of essences is completely different from the production of abstractions. This is the basis of the distinction made by Heidegger between present-at-hand and ready-to-hand. Abstraction is something rendered present-at-hand, and Essences are something rendered ready-to-hand. Essences are constraints on characteristics that appear as attributes of an object. Abstractions are glosses that leave out details and particulars. Essences are from the objects themselves as their self-organization of their characteristics, while Abstractions (Universals) are from us as we filter out what is non-essential from the essential in our experience. Heidegger makes a brilliant synthesis of all these influences, that overcomes many of their weaknesses by going back to Aristotle and looking at his types of Knowledge, and concentrating on the kind of knowledge that is practical. Heidegger makes the difference between Essence Perception and Abstraction into modalities of Being related to totality and unity respectively. We related to the totality of the infrastructure of technology though a circumspective concern in the making which is different from the way we relate to finished products that that present abstractions. Then he focuses on showing how Being and Becoming are equi-primordial and exemplify these two modalities. And then he focuses on Time and the ecstasy by which dasein projects Being as a whole combining the two modalities. We call this the monolith of Being and recognize as valid M. Henry’s criticism of Heidegger’s assumption of Ontological Monism based on his reading of Meister Eckhart. Heidegger does not consider that Being might have an unconscious, i.e. an essence that is never manifest. In this way he is similar to Husserl. Heidegger as we said combines Ontology, Hermeneutics, Semiotics, and Phenomenology in a single comprehensive system for understanding the worldview. What he leaves out is dialectics. Merleau-Ponty tries to represent Heidegger in a psychologically comprehendible way and discovers the concomitants of present-at-hand is pointing, and of ready-to-hand is grasping. He goes on to identify that as we make our tools part of ourselves we expand our being-in-the-world and that has to be another kind of Being. He calls that the hyper-dialectic between Process Being and Nothingness of Sartre which is the inversion of the kind of Being that Heidegger introduces as being dynamic. Sartre goes back to Hegel and introduces the terminology of Being in-itself and for-itself, as well as Being in-and-for-itself. Sartre is dismissed these days as misunderstanding Heidegger, but when we consider how deeply rooted Heidegger’s thought is in Hegel this needs to be reassessed. Heidegger recognized this third kind of Being, as Plato calls it, as Being (crossed out) and Derrida picks up on that and calls it Differance. Merleau-Ponty goes on to discover the fourth kind of Being he calls Wild Being which is the contraction of being-in-the-world that is the dual of Hyper Being. Thus, the emphasis of Merleau-Ponty is on the development of our understanding of the kinds of Being by making them concrete in our experience. Other thinkers like Levinas contributed to this project by recognizing that the concomitant of Hyper Being is bearing. For Merleau-Ponty dialectics is as Hegel and Marx defined them and is taken for granted. He spends more time on the sign and its embodiment. In general, Merleau-Ponty’s biggest contribution is extending the kinds of Being which then were explored by others such as Derrida (Hyper Being) and Deleuze (Wild Being). Phenomenology is what appears in consciousness. But also in Continental Philosophy there has been an obsession with understanding the Unconscious, that which does not appear, or is hidden and must be uncovered. We get this development prominently in Lacan, who is interpreted by Badiou and Zizek today but who had a big impact on Deleuze, who tried to make something useful out of Lacan’s cryptic ideas about the functioning of the unconscious which was based on Semiotics and Structuralism. When we look at the development of Phenomenology in Hegel, Peirce, Husserl, Heidegger, Merleau-Ponty, Sartre, Derrida, M. Henry, Lacan (via Zizek), Deleuze we get a very interesting field of similarities and differences which are very thought provoking when read in the context of each other. Also if we take Dreyfus seriously we can see that Foucault is part of this tradition also because he took the structures he discovered in Heidegger and applied that to the analysis of Power. It develops all the strands of Modern Continental Philosophy which are ontology, phenomenology, hermeneutics, and dialectics, as well as structuralism and semiotics. Most philosophy, like Analytical Philosophy is trapped in the Present-at-hand and never escapes. Continental Philosophy escapes into the meta-levels of Being where the aspects of Being (truth, reality, presence, identity) are transformed emergently at each stage up to five where we suddenly discover existence. Thus if Ontology can be extended up the meta-levels of Being by using Russell’s type theory to understand it, then also Hermeneutics, Phenomenology, and Dialectics can be extended as well. Merleau-Ponty has developed this extension for Phenomenology based on the fundamental framework developed by Husserl and Heidegger of splitting modes of being-in-the-world. Basically, the monolith of Being containing Pure and Process Being is what is conscious and the Hyper and Wild Being pair is unconscious and so that explains why these higher modalities are only recognized with difficulty. Hermeneutics can be seen in our recognition that the aspects of Being transform as we move up the meta-levels. And in my dissertation I have taken the dialectics and trialectics of Hegel and extended them into the realm of Quadralectics and Pentalectics. (see http://emergentdesign.net). Understanding what Phenomenology is at a deeper level means understanding the field of Phenomeologies as developed in the tradition, and that is continuing beyond those mentioned, and also understanding phenomenology in the context of the other strands of postmodern philosophy. Implicit in this is a critique of Analytical Philosophy. Analytical Philosophy never knows anything but Pure Being. Analytical Philosophy sticks with Truth as Verification. They call themselves realists but this is only understood in the most basic sense, not as it is transformed as we move up the meta-levels of Being. Same with Identity and presence. Notice that Phenomenology is about what becomes present. But deeper phenomenologies deal with how what is present relates to what is absent and recognizes the dynamism of showing and hiding. Ontology deals with the status of entities that have their own identities both as abstractions and essences as well as ideas and concepts. Hermeneutics deals with truth as it unfolds at the various meta-levels of Being. That means dialectics has to do with reality and the synthesis we encounter prior to what ever reductionism and analysis we perform. Synthesis is given in our experience, and thinking is for the most part is reductive in our tradition. Analytical Philosophy only works with reason alone and tends to ignore experience as it searches for a completely rational utopia. It eschews the consideration of time and its impact except in the realm of argumentation. It ignores real meaning and accepts the abstractions of symbolic logic and set theory as its basic building blocks. It is happy living blindly on the surface of the worldview, and not recognizing its depths like most people. Once we recognize the depths of the worldview then we have to render an account of it, and that is the task that Continental Philosophy has set for itself. The latest installment in that project is Badiou’s Being and Event. Continental Philosophy is an intellectual adventure of the first order, which uses all of history, literature, psychoanalysis, and science as its springboard for new discoveries about the nature of Being. But this was all kicked off by Husserl who decided to make Kantian Idealism more embodied in the world so he could understand the place of logic and number in consciousness. Now philosophies that do not have a phenomenological, hermeneutic, ontological, or dialectical component are laughable. And that is the bulk of Analytic philosophy. We can think about this in relation to the Aspects of Being. Formal Systems are based on Identity, Presence and Identity and thus these are taken for granted by the Analytical philosophers as the basis of their work with set theory and symbolic logic. But Analytical Philosophy itself considers itself realist, and thus concentrates its effort on identity, truth, and reality, leaving aside presence as an imponderable. For instance, Schlick wants to separate concepts from precepts to create a general science. So the presence aspect of the formal system is downplayed and the reality component that is missing is given pride of place in their philosophical framework. Phenomenology on the other hand does not start with the formal system but with the phenomenology of consciousness which is the context for our manipulations of the formal system. Phenomenology identifies presence as the key aspect which it gives prominence to. So there is a symmetry breaking in Philosophy between the formal system and analytic philosophy, but on the other hand also between Phenomenology when it emphasizes presence as the source downplaying reality. Phenomenology is interested in truth and identity, more than reality. Truth are seen in its attempts to understand reasoning and judgement, and identity in its attempt to understand the noematic nucleus and essence of the object. So we see that there are here three symmetry breakings where on aspect is left out. And never the twin shall meet. Phenomenology is the necessary antidote for Analytical Philosophy, just as Formal systems are the antidote for Continental Philosophy. So that is why I try to develop formal systems in the context of Continental Philosophy. It is by taking the antidote that meaning is generated in each framework. The formal system generates meaning in model theory by introducing reality. Posmodernism generates meaning by the reintroduction of identity, as we see in Badiou’s work which reduces ontology to mathematics and presumably epistemology in his next work to logic. « Quora Answer: What is Namesake?